I have to admit, I'm not all that excited about the Super Bowl this year. The actual game almost never lives up to the hype, and the commercials haven't been particularly memorable in recent years either. However, one thing I am looking forward to is the elaborate spread of food at my sister's house. Here are the artery-clogging appetizers I'm planning to contribute. Not long after Christmas, we had some leftover wonton wrappers and an odd assortment of other ingredients still in our fridge. I looked through a bunch of wonton recipes on the internet, but couldn't find anything that we had all the ingredients for, so I decided to just wing it with what we had. And wouldn't you know it, they turned out really good. I even made them a second time the other night for dinner, doing my best to recreate what I had thrown together. Now I have decided to write the recipe down, though I am guessing some of the amounts. Heat a nonstick skillet over medium heat. Cook chicken breast in olive oil. When chicken is mostly done, add garlic, sesame oil, soy sauce, and ground ginger according to taste. Sauté a few additional minutes, then place chicken, cream cheese, and chopped red peppers in a mixing bowl. Use a hand mixer or food processor to combine. Lay out wonton wrappers on a clean surface. Set aside a bowl of water to dip your fingers. Place about 1 teaspoon of the chicken mixture onto the center of each wrapper. Wet the edges by dipping your fingers in water, and wipe the edge of each wrapper. Fold over into triangles, and press to seal. Take the two opposing points of the triangle and fold around to join together. 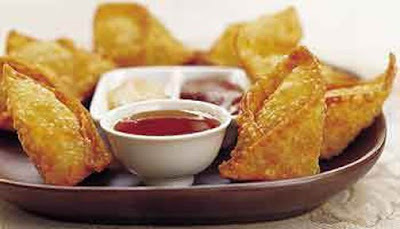 Heat the oil in a deep-fryer or deep pan to 375 degrees F. Deep-fry several wontons at a time, turning as needed, until lightly browned. Remove to drain on paper towels. Makes 15-20 wontons. Serve with sweet & sour sauce. We have made buffalo wings before using the recipe on the hot sauce bottle, which basically just says to bake the wings then smother them with hot sauce and butter. So we will see if adding some additional seasonings helps or hurts. The notes on allrecipes.com say this is similar to the hot wings recipe used by a "popular restaurant chain," but didn't specify which one. In a small bowl mix together the flour, paprika, cayenne pepper and salt. Place chicken wings in a large bowl and sprinkle flour mixture until they are evenly coated. Cover dish or bowl and refrigerate for 60 to 90 minutes. Combine the butter, hot sauce, and garlic powder in a small saucepan over low heat. Stir together and heat until butter is melted and mixture is well blended. Remove from heat and reserve for serving. Heat oil in a deep fryer to 375 degrees F. The oil should be just enough to cover wings entirely, an inch or so deep. Fry coated wings in hot oil for 10 to 15 minutes, or until parts of wings begin to turn brown. 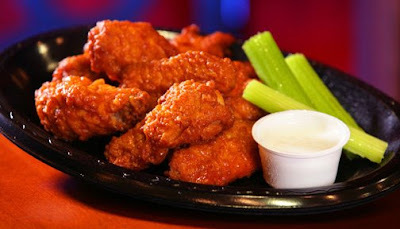 Remove from heat, place wings in serving bowl, and coat with the hot sauce mixture. Serve with celery sticks and bleu cheese or ranch dressing. Can't wait(for the food that is).. who's playing again? Those wontons look good. There is a restaurant out here called Crescent City Grill that serves the best crab meat wontons. Perhaps we can try and use your recipe, and add a little crab meat too. Sounds just like something Cam would make. I thought you said Cam's specialties were pancakes and garlic bread.